Three top young innovators have emerged from the African Development Bank (AfDB)’s AgriPitch competition – a contest that embodies the dynamism of African youth as future of agriculture on the continent. Ababio Kwame from Ghana was awarded first prize, while Mary Joseph from Kenya won second place. Mahmud Johnson of Liberia clinched the third prize. The young Agripreneurs were announced during the Bank’s 52nd Annual Meetings taking place from May 22-26, 2017 in Ahmedabad, India. 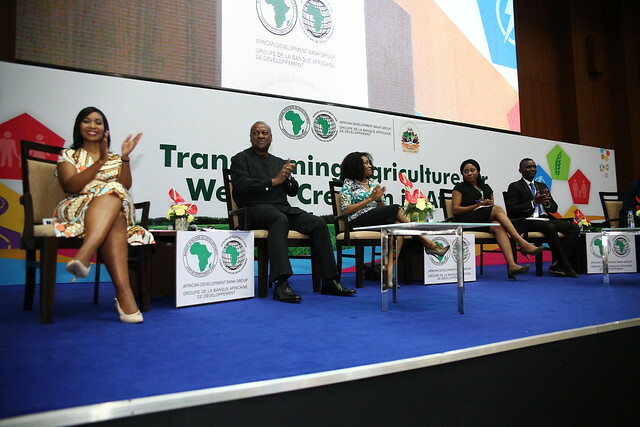 The competition was launched in March 2017 by the Bank in Abidjan, to show agriculture in Africa under the banner of innovation and is set within the wider framework of the Annual Meetings session “Agriculture is Cool: Engaging Africa’s Youth”. Ababio Kwame, 24, is the owner and founder of Green Afro Palms. Formed in 2012 in Ghana, his company specializes in the production, extraction and marketing of palm oil. It has also gone into transformation, with the sale of higher value-added products, including palm fibre cakes and cosmetics. Founder of J-Palm Liberia, Mahmud Johnson, 23, won third prize for the innovative cosmetic products he developed produced from palm oil and palm kernel oil, focusing on serving local customers. His products were based on a detailed consumer-oriented market study he conducted. For her part, Evelyn Ohanwusi, Head, Partnership Advocacy and Resources Mobilization for the IITA Youth Agripreneurs Programme, stressed the need to increase mechanization in the sector, as well as using new technologies. “We need a tractor to cultivate the fields. But we also need the Internet, so that we can order a tractor,” she said. The African Development Bank has released close to USD 800 million in six countries to support agricultural projects developed by young people, namely in Sudan, Nigeria, the Democratic Republic of Congo, Malawi, Cameroon and Zambia. More projects are expected to be approved in 15 countries in 2017-2018. Thanks to the Bank’s initiatives, over 300,000 enterprises and over 1.5 million direct jobs are expected to be created between now and 2025. Over 3,000 delegates, including Heads of State and Government, Ministers of Finance and Heads of Central Banks, participated in the AfDB Annual Meetings in India. To find out more about the AfDB’s Feed Africa Strategy, click here.